Prime Minister tells French Fabius “an endemic instability” threatens the entire Middle East, not because of Israel. 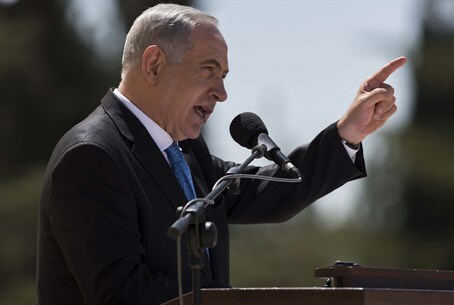 Prime Minister Binyamin Netanyahu said Sunday that even if Isrsel achieves a peace treaty with the Palestinian Authority (PA), this will not stop Iran's centrifuges or change the fact that there is “an endemic instability” in the Middle East. "I know that France shares our interest in the ongoing events in Syria that are tragic. I think what is going on there is a crime committed by the Syrian regime against its own people. It’s truly shocking. And these atrocities must stop. “I have to say, however, that Assad’s regime is not acting alone. Iran, and Iran's proxy, Hezbollah, are there on the ground playing an active role assisting Syria. “In fact,” said Netanyahu, “Assad's regime has become a full Iranian client and Syria has become Iran's testing ground. Now the whole world is watching. Iran is watching and it wants to see what would be the reaction on the use of chemical weapons. “What we see in Syria is how extremist regimes have no reservations whatsoever about using these weapons even when they use it against innocent civilians, against their own people. This demonstrates, yet again, that we simply cannot allow the world's most dangerous regimes to acquire the world's most dangerous weapons. “In the end, the extremists use these weapons. So we must prevent them from having these weapons. Netanyahu made clear that he was referrng to Iran’s pursuit of nuclear weapons. “What is happening in Syria,” he said, “simply demonstrates what will happen if Iran gets even deadlier weapons. “I think the situation in Syria also exposes another truth, and that is that there is something very deep and very broad in the turmoil in the Middle East,” he added. “We see the entire region from Morocco to Afghanistan in turmoil, in convulsion, in instability. And that’s an endemic instability that is not rooted in this or that conflict but in the rejection of modernity, in the rejection of moderation, in the rejection of progress, in the rejection of political solutions. “This is in fact the core of the problem in the Middle East. It’s something that threatens everyone, threatens moderate regimes, threatens Israel, threatens the West and threatens all those who don’t believe in the doctrinaire dogmas that guide the extremists. Peace with the PA, even if achieved, will not solve this root problem, he stressed. “[F]or too long, people believed that the root cause of this instability in the Middle East was the Palestinian-Israeli problem. It is not the root cause; it’s one of its results. It’s one of the results of the regional turmoil, and in fact it is merely a manifestation of one of its many problems. “If we have peace with the Palestinians, the centrifuges will not stop spinning in Iran, the turmoil will not stop in Syria, the instability in North Africa will not cease, the attacks on the West will not cease. “We want peace for its own sake. We want peace because we want peace with our Palestinian neighbors, because we want to live in peace, and anybody who’s been at war knows the consequences of not having peace.